Among the myriad of things I missed when I was away was music. Not the piped music from my computer, but the sheer joy of making (and indeed simply regurgitating) music with other people. I have had the pleasure of playing with some wonderful musicians, and some even more wonderful people. The only way you get better is by playing with people better than you. Though by that argument I should maybe be getting on better than I am. Of the 5 weddings I’m at in the 6 weeks I’m home, I’m playing at two of them. The old Nice Guy Eddie reunited tour. The Spice Girls have nothing on us. And tonight we got round to practicing again. I’ve been without an electric guitar for the guts (and indeed heart, liver and lungs) of a year. I can do G, after that it gets a bit fuzzy. I picked up the guitar from church before the practice. It took me a while to figure out where to plug things. I gave it a go. It sounded awful. I would like this to be the passage of time and old strings, and possibly a blown valve, but alas no. The truth is I’m crap again. Now I’m still better than most of you. I’m still a decent guitarist. That doesn’t change. But I’m about 10 steps backward form where I was. 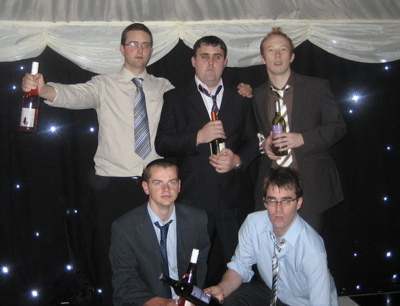 The guys play their new version of Mr Brightside that they came up with to cope without a guitar. And it’s stunning. It’s everything I love about the three of them. It’s them at their very best. And I realise I have missed out in being away a year. It’s so good, I have no desire to find a niche to fit some guitar into the song. I like playing covers, cause I can copy what someone else played. I can copy other people quite well. When it comes to originality I struggle somewhat. Horrible noises come out of the guitar. I get more angry and frustrated at myself. I get angry and frustrated at my frustrated anger. I am crap again. I know not why this annoys me as much as it does. Fried food is not the ideal sporting and fitness nutrition. It is tasty though. We began the day with a ‘full ulster’ (which bears no resemblance to a full monty), and left our cosy lodge behind in glorious sunshine. This part of the upper bann begins to get a little more populated. The odd farmhouse appears on the hill sweeping down to the river. Cows stare balnkly at us. That’s all cows do it seems. It’s no wonder they’re so far down the food chain. We see an otter. First of all we see a stick, then the stick moves and turns out to be an otter doing the backstroke. The otter makes our day. It dives under the water and reappears right beside us before scarpering away. Our last obstacles are the floodgates at the cutts, just outside Coleraine. From a mile away we can see the red flashing lights indicating the gates are open and the flow is too dangerous to get through. By this stage we’re past the last jetty and have to do a (only very slightly) panicked turn and paddle upstream to the car park we just passed. Dad runs down to the lock and chats to the lock keeper about the feasibility or running it. He told us lots of horror stories about people being sucked in and drowning and how they never found the bodies. Well no, I made that up. But he put us off. For the record we think we could have ran it. So we had to ‘portage’ the gear round the weir. This involved getting wee Liz (the original pudge) to drive up. We put the canoe on the roof and drove the mile past it and put the canoes back in the water. To finish the trip we put all three of us in the Canadian, with minimal gear and paddled through Coleraine. We had a good reception. Well there were no youths throwing bucky bottles at us, so I consider that a good reception. 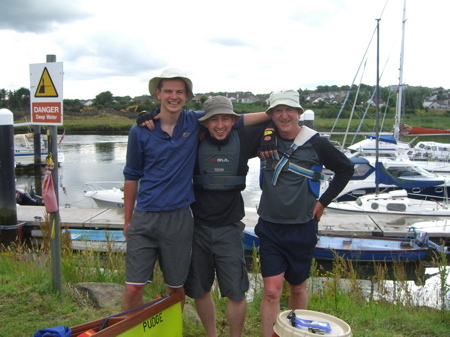 We stop at Coleraine Marina, having managed 70 miles of paddling in 4 days. My girly, hospital hands are blistered and sun burnt. Simon’s even girlier programmer hands are blistered despite his 3 quid gloves. The gloves have a hole on the back of the wrist, leaving him with a 3cm diameter burnt patch on the back of his white hands. This looks like ‘the all seeing eye’ and I imagine will be hard to explain when he goes back to work. When I was in NZ I always told people that NI had very little going for it on objective terms. It was wet, we all hate each other, you can’t get a decent cup of coffee. But that I loved it simply cause it was home. But now I stand corrected. In 4 days I’ve seen NI from a point of view I’d never seen it from before, that it can be more beautiful than I had perhaps expected. I imagine, like most things, that it was always this way, I just never bothered to notice. So I’ll take my “my country is better than your country” attitude and place it in the ever increasing box of unpleasant character traits that I’m slowly beginning to fill. We started the day in rain. Sorry to witter on about the rain but it’s a bit of a novelty. You’d think by now I’d be getting used to it. From Ballyroney we got a clear crossing across the top of the lough. It was calm so we just braved it straight across the lough instead of hugging the coast. Our only company was a huge sand dredger. Apparently the sand from the bottom of the lough is big business. They take it from the edge of a 130 foot trench that forms the channel of the Bann before it leaves the lough at Toome. I suppose now is the time to supply a little lough history (like most things courtesy of Peter the warden on Coney island). The lough used to be about 5 foot either than at was. But not consistently so, and that was the whole problem. The lough went up and down with the seasons, flooding all the farm land. A bright spark somewhere came up with the idea of controlling the lough height using the upper Bann (seven rivers into the lough and only the upper Bann out). So they put in a mixture of massive floodgates and weirs along the upper Bann. All this for five foot of slightly damp, grotty looking land on the shore of lough Neagh. Not sure if I’m convinced. Then I’m a softy townie so what would I know. Immediately after the floodgates lie the eel traps, cages sunk in the water to trap the slimy little creatures as they pass through. And the eels too I suppose. On a further, fascinating lough Neagh fact, the lough Neagh eel actually originates and breeds in the Caribbean. Why on earth it crosses the Atlantic to end up in lough Neagh is beyond me. So in the shadow of the floodgates we find a canal and a lock gate, complete with lock keeper and all. We pay 50 pence for each canoe to got through the lock. What can you buy for 50 pence these days? The Bann runs for about 2 miles before it enters Lough Begg, as if it’s not quite ready for a sprint yet, and could do with a sit down and a quick ciggie before getting into it proper. Lough Begg is deserted, no roads run near it, there’s barely any houses visible. In flood, half the trees at the edge are underwater, forming mangrove-like swamps that you can paddle under. I didn’t think anywhere this deserted in NI still existed. We stop in Portglenone for chips, just before the rain hits. The proper, thunderstorm rain, with lightning and hail and drops so big they look like they’re hitting tarmac when they hit the river. I find new definitions of wet. We take our chances and hide under the trees at the edge of the river, hoping the lightning doesn’t hit. The clouds turn all shades of grey and black in front of us. The Roman Empire had no word for grey till they reached Britain. Though I presume they had no word for ‘metrosexual’ or ‘Paris Hilton’, but they coped just fine without them it seems. We sneak from under the trees into glorious sunshine, when we get more sunburn. This seems all wrong. It is July I remind myself. Already in the distance we see another Armageddon cloud mounting on the horizon behind us. Advancing toward us quicker than the river will carry us away. As we approach Kilrea, the rain and hail hits again. On our left is a jetty, with a suspiciously placed travel lodge attached. Indeed there may even be a shaft of light sneaking through the clouds to illuminate all it’s prefabricated glory. The flow drags us past it before it even registers. It’s amazing how the call of a warm bed and hot shower enables you to paddle back upstream. We leave the already sodden tent under the canoe in the garden. Da got up at 0600 to pee. Well I don’t think he even had to wake up as he never slept. I’d dozed on and off, even at one point sleeping on my back. An almost unheard of phenomenon. Dad did his usual, rolled over onto me, kicked off the sleeping bag, took cramp, rolled back onto me, eventually made it out of the tent, peed, took cramp again and made it back to the tent. We feasted on bacon, soda and potato bread, washed down with the little packet cappuccinos, that have the annoying tendency to coagulate when you add hot water forming little, submerged coffee croutons that surprise you like a fly in your drink. The flies in the cappuccinos weren’t a surprise at all. It was sunny. This took us all by surprise. The lough was like a mirror. This also took us by surprise. Instead of the plan of cautiously hugging the shoreline up the west coast lough, we abandoned sense and reason and set off straight down the middle for the top left of the lough. We could see as far as the land went, from the shadows of the mournes behind us to Divis at the north east and Slieve Gallion on our left. Lough Neagh was a little oasis of blue sky surrounded by clouds. Huge, billowing clouds, stacked up on each other like hay bales in a barn. Great big James and the giant peach clouds. I felt like something out of Lord of the Rings, or Narnia. Simon said he was listening to Sigur Ros in his head. That type of a scene. We had lunch beside a graveyard, where a cow was drinking out of a motorboat. As one does. And it was then the wind began to pick up. It was then I started to get wet. On the trip we have a proper kayak, with skirt and all the rest. Designed to take a bit of chop. We also had a Canadian style canoe. The lime green wonder boat pudge the first as she’s been christened. Pudge isn’t really designed for chop. More for keeping my Da busy with redoing the wood bits, or for cows to drink out of in graveyards. It may, at a push manage a drift down the river Bann. There was at most a foot and a half swell. A bit of chop for a lake, but nothing wild. But if felt like that. We were broad siding a lot of the waves, up and down the crests and troughs. We were on our knees in the canoe, largely for balance but the occasional petition along the way. I doubt there was ever any danger of death or even injury. But there was definite danger of getting pretty wet and losing a barrel or two. After an hour of this we began to settle into the routine of zig-zagging to and from the shore, to avoid broad siding on the bigger waves, or worst of all, when a shallow sand bar would push the swell up into breakers. We made almost 3 mph. Not bad considering. I have no idea how many knots we were making. I’m not even sure we were supposed to make knots. In the end we made Ballyronan marina for 4pm. It was a sunny Sunday afternoon and the crowds were out to see us. Well, what I mean is that the crowds were out to see the sunny Sunday afternoon and happened to see us. And so we got the first wash in two days and realized how burnt we’d got. (Despite the factor 30 we’d all applied religiously Liz.) We’re staying in a campsite, conveniently placed right beside the marina and yes – a Chinese restaurant. Oh how I have missed monosodium glutamate. Canoeing and kayaking has become something of an obsession in the Neill household. Maybe not an obsession, but definitely a past-time. In my absence, both Dad and Simon have got their own canoes and associated gear. They now look quite the part. 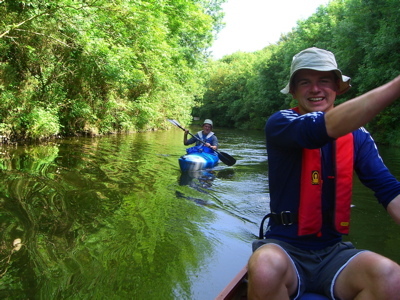 Some may remember a few blogs on family canoe trips from before I went to NZ. Some remember something along the lines of Douglas Coupland’s ‘all families are psychotic’. No one got killed. We’re all still talking. One of the plans for when I’m home was to canoe from Portadown to Coleraine. A trip we got a third of the way through last year. We had a brief planning session for this trip a month ago. When I was in NZ, Da was in Porteedown and Si was in Manilla with work. The wonders of conference calling with skype. We left Shillington car park at 11 am. It was sunny. The drunks on the bank were smiling. Though they weren’t even drinking yet. The sun was not yet over the yardarm. Not that I could see a yardarm anywhere about. 20 minutes later we were sheltered under a tree and our US army surplus ponchos in a rain storm. There was thunder. And yes, this is the middle of summer I remind myself. The advantage of all the recent rain means that there is a good flow in the river. We don’t so much have to paddle as just direct the canoe. At lunch we’re shivering and squatting in our tent-like ponchos. I’m feeling like it would be a good idea to return to civilization, or at least Portadown. Si is hopelessly optimistic. Our first camp is Coney island (no not the Van Morrisson one), where we stayed last year. It’s a Craigavon council run site, and has the rare exception of being well run. This has most to do with the warden, peter, who lives there. I’ll spare you the history of the place, it’s in the blog from when we were there last time. It remains, a fantastic gem of a place. When the sun shines you could be somewhere else entirely as opposed to a pile of mud and trees in the middle of lough Neagh. In the midst of this glorious isolation and tranquility a motor boat turns up carrying one of the nurses I used to work with in Craigavon ICU. He has a pint of milk for Peter the warden. I am definitely home. Only NI could be this small. Over the course of the evening about 20 people go through the place. Including three boat loads of drunken (but very civilized and good bant) men from Antrim and a dog on a jet ski. At dusk the sky fills with flies. Fills in a way I’ve never seen before. Brief natural history of the lough Neagh fly. Spends 90% of its time as larvae on the bed of the lough, eating whatever fly larvae eat – probably McDonalds. They emerge from the lough in three major ‘hatches’ a year, filling the sky like clouds. After a sharp frost one year, Peter found them 2 inches deep on the island. They do all their eating underwater, so the good lord felt it superfluous to provide them with mouthparts for the airborne form. As a result they can’t eat, and most importantly can’t bite. The 10% remaining of their lives they spend trying to mate and flying up my nose, occasionally trying to do both at the same time. They do this until their supplies of energy run out, and they fall from the sky to form the next layer of protinaceous sludge in the food cycle. It’s a life I suppose. We spend the night sitting round a camp fire with the drunken men from Antrim talking about the flies (hence the above) and trees (hence below). NI used to be covered in trees. At least I suppose so. Anywhere this wet must have been covered in trees at some point. They’ve been gone for a while now. Shortly after the humans arrived I imagine. We were talking about new laws saying that you’re meant to cut down non-native trees, to preserve the natives. Apparently on Coney, they were talking about cutting down an 800 year old elm as it was non-native. Makes you wonder what a tree has to do get a passport. Considering the Normans only turned up 800 years ago, then most of us would be non-native and worth chopping down too.